March 20th, marks the first day of spring here in the United States. Alfred Tennyson called spring, the boyhood of the year. How charming! Well, two boys found the first day of spring a perfect day to brush off their winter sluggishness and headed on down to the town fishing hole. Pleasure fishing, if you allow me to make a comparison, is like meditation. In meditation–what little I know on the subject–your end goal would hopefully bring you to a more peaceful state of mind. That’s my take on it anyway. Fishing, if you think about it, has the same effect. You know. Calm. Peaceful. Rested. Okay, it works like this. Once you cast your line out, you wait. With the waiting, and the sounds and smells of nature surrounding you, one can quickly be calmed into a very relaxed state of mind. That is, until you get the tug. First, it’s small. Then, you get the big pull . . .
here it comes . . .
First day of spring dinner catch–Bass! While the one boy fished, the other decided to catch some ticks. Simply not a delightful, first day of spring activity you would like to engage in. Fishing and tick collecting is how two boys welcomed the boyhood of the year, Spring 2012! How did you welcome the new Spring of 2012? Just wish catching fish is as easy as catching ticks…*sigh. 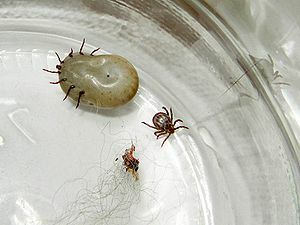 Ticks–small, but quite powerful!! Thanks for your advice Orples! I am with you Ansuyo! Yikes! Nice photos. Looks like a lot of fun. filling the bird feeder once a day — sometimes I thinks it’s spring that welcomes us — the return of the passerine birds, snow to mud to green grass, creeks and rivers rushing with snow melt. . .